Sebastopol Gallery is featuring “Re-Creation,” new work by artist Michelle Hoting, who creates her jewelry using repurposed metals. In her latest work, Michelle explores and recreates the ancient mixed-metal technique of makume gane. Layering, folding, and forming steel, copper and bronze to create a wood-grain-like pattern, she reimagines the metals into wearable sea creatures, landscapes, and touchstones. I'm teaming up with my friend and wonderful Healdsburg based painter, Jamie Luoto to throw an intimate, invitation-only event for you to peruse our artwork, visit with us and toast the holidays. Saturday February 10, 4–6 p.m. Nature speaks to us in a language all her own, and artists Michelle Hoting and Susan St. Thomas each has a unique way of expressing what she hears. 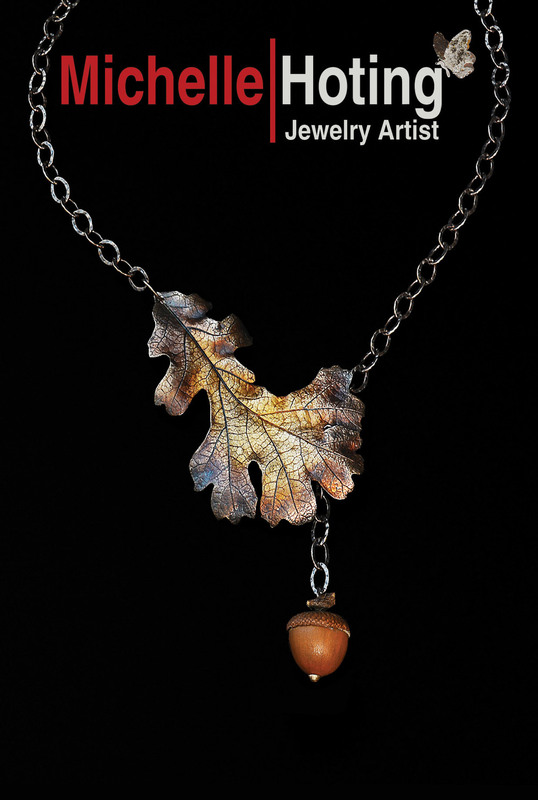 Michelle finds her inspiration in the forms of trees and leaves, flowers and buds. Giving their spirit and shape permanence by sculpting in recycled silver, copper and steel and utilizing various metalsmithing techniques, Hoting works to impart a feeling of movement and life. The divinely inspired collection of mixed-media works by Susan St. Thomas is comprised of diverse abstract interpretations of the unseen realms of nature. Some pieces are interpretations of actual celestial images photographed by the Hubble telescope, while others are poetic expressions of love and devotion. Moved by the vast space beyond earth and the beauty of the unexplored, Susan creates layered acrylic and watercolor paintings to represent our multi-dimensional world. 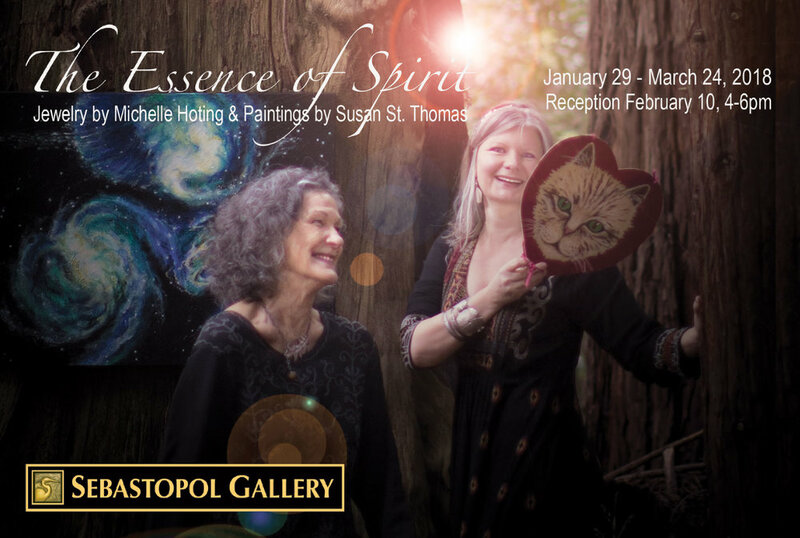 Meet Michelle and Susan at the reception for their exhibit on Saturday, February 10, from 4-6 p.m. Join us any time at Sebastopol Gallery to see fine art and crafts by 15 local artists. Open daily 11 a.m. - 6 p.m., 150 North Main St., Sebastopol. Corrick's 1st Annual Jewelry Trunk Show! Sip some cider, Meet the artists, nibble on holiday treats, find the perfect gifts and get them wrapped. Just $3 provides entry for both days! Children 12 and younger are FREE. Celebrate the season with gifts for yourself or loved ones in this festive shopping experience featuring 80 artisan vendors! Back for its 43rd year, this traditional event offers unique handcrafted wares, live entertainment, a kids' craft area open on Saturday from 10am-2pm, and food and beverages available for purchase. Plus, take a ride on Rosie the Trolley for FREE to the Luther Burbank Home & Gardens Holiday Open House! · Live entertainment both days! · A ride on Rosie the Trolley for FREE to and from the Crafts Fair to the Luther Burbank Home & Gardens Holiday Open House! · Prize Giveaway Fundraiser in the main lobby. · Kettle corn, cookies and hot beverages for purchase. · Breakfast & lunch items for purchase provided by a local restaurant. Sonoma County Art Trails Open Studios is a way to see incredible art, meet the artists, and tour the beautiful Sonoma County countryside all at the same time. The event, held in various locations throughout Sonoma County allows visitors to see artists at work in their studios. Art Trails is sponsored by the Sebastopol Center for the Arts and is scheduled for two weekends every October. Come for the wine and stay for the art! Pick up the artist directory/map at locations county-wide, or view it online at www.sebarts.org (available in late September). completely new work created by professional artists since the last presidential election. Intelligent, passionate, and expert, it is not typical political art. Artists include Fred Vedder, Suzanne Edminster, Karina Nishi Marcus, Gerald Huth, Christie Marks, Kate Black, Serena Hazard, Michele Botaro, Adrian Mendoza, Sandra Rubin, Michelle Hoting, Caren Catterall, and others. Join us for this powerful show by your local arts community. Over thirty local artists have created completely new work in response to the recent presidential election for “The Art of Resistance” pop-up gallery in the SOFA Arts District in Santa Rosa. The Art of Resistance opens on First Friday, February 3, 2017, 5-8PM in the Backstreet Gallery, located behind 312 South A Street on Art Alley. Artist Gerald Huth created his sculptural collages directly after the election. “My parents didn’t flee Europe so I would see this disaster taking place in America today,” he said. Moving, passionate, and expert, it is not your typical political art. Mill Valley Fall Arts Festival proceeds benefit the Emerging Artist Scholarship Fund. It’s time once again to enjoy two fun-filled weekends of fine art appreciation. Sebastopol Center for the Arts and Art at the Source want to welcome you to our 21st annual free self-guided open studio tour of western Sonoma County. Local artists, Michelle Hoting (jewelry) and Abigail Zimmerman (oil painting) share how they express their love of Sonoma in their joint show, A Different Way of Expression; A Celebration of Sonoma County benefiting Sonoma Land Trust at Corricks Art Trails Gallery in Santa Rosa during the month of February. Come celebrate the season and support our local artists from Sonoma County! NightLife is a weekly event where visitors ages 21 and older can enjoy music, science, entertainment and cocktails, while experiencing the Academy’s world-class exhibits with friends. Each weekly installment features something new and different. GROOVE along to local music, SIP Cocktails and More! Sultry, Steamy, Exotic, Artfully Provocative. During the week between open studios, many artists open their studios on a scheduled night based on geography. NOT all studios are open, just those who chose to participate. Click here for full list of participating studios. First Saturday Arts Market is a monthly outdoor fine arts event featuring the works of dozens of visual artists. Located in the Historic Houston Heights by Gen’s Antiques at 548 W. 19th St. at Lawrence St., the market showcases paintings, sculpture, photography, jewelry and handcrafted items. Bring the entire family and come enjoy the great outdoors, live music and delicious fare from some of the area’s best gourmet food trucks. Open year-round on the first Saturday of each month, the market is open from 11 a.m. - 6 p.m. September through May and from 6-10 p.m. from June through August. For more information visit us at www.FirstSaturdayArtsMarket.com or call 713-802-1213. Join us for the 40th annual Dickens Holiday Crafts Fair! $2 - Children 12 and under are FREE. Keep your ticket so you can re-enter the fair for free, should you wish to come back and shop anytime December 6-7, 2014! Only service animals allowed in Crafts Fair; no other pets will be permitted. Celebrate the season and find gifts for all of your loved ones with a festive shopping experience featuring over 70 local artists. Shop for quality, hand-crafted holiday décor, home goods, jewelry, bath and body products, edibles and more all sold by the artists! Click here to get a sense of what to expect! · Live entertainment and a visit from Santa! · Prize drawing in the front lobby. Several vendors have contributed craft items to the drawing and you could be a lucky winner if we draw your ticket! Proceeds from the prize drawing ticket sales benefit the Santa Rosa Recreation & Parks Scholarship Fund. Last year, over $1,900 was raised providing swim lessons and summer camp for many youth in need! Suggested ticket donation price is $1/ticket or $5/6 tickets. Sonoma County Art Trails Kick-off Celebration and Live demonstrations by artists, Cheryl, and Mikio from Nichibei Potters will be throwing and carving pots, Brooks Anderson will speak and demonstrate on his process and many artists will be free to discuss their art in a one-on-one settings! featuring over 70 of the county's finest artists. Please join us! Come meet the artists, enjoy hors d'oeuvres, wine and watch and chat with the artists. Plan your Art Trails experience by visiting the Cloverdale Arts Alliance Gallery. Sonoma County Art Trails Preview Show featuring over 70 of the county's finest artists. PARKING: Free parking will be available at the entrance to the park. A shuttle will be provided. Regular day-use parking fees apply - $8 per car if participants choose to park in the picnic area. Those with special needs should call (707) 869-9177 for specific parking information and shuttle service. The Barlow Street Fair is back on, continuing the celebration of the bounty and creativity of our surrounding region and community. The Barlow Street Fair will run from 4:00pm – 8:00pm every Thursday evening July 3 through October 30, 2014. Each week the streets will be lined with Sonoma County’s premier crafts people, service providers, and food vendors offering something special for all ages and diverse circles of people. See you down on McKinley Street! The first two weekends in June, you're invited to discover the natural beauty and artistic abundance of Sonoma County during Art at the Source Open Studios. Along scenic highways and country roads, you can visit the working studios of members of Sebastopol Center for the Arts, which will be open to the public 10am-5pm. Renowned for its artist community and bohemian culture, Northwest Sonoma County is rich with stunning landscapes, superb cuisine, and world-class wineries making it the perfect getaway to discover art. And when the day is done, spend the night in a cozy inn or B&B. Studio locations range from the coastal villages of Bodega Bay, to the inland communities of Valley Ford, Monte Rio, Guerneville, Forestville, Graton, Sebastopol, Occidental and West Santa Rosa. The annual Art at the Source Tour features more than 165 artists in almost 100 studio locations, and the diversity includes painters, sculptors, potters, jewelers, photographers, glass, wood and fiber artists. Many studios have more than one artist. There is something for everyone to explore and enjoy. To plan your tour, visit the Preview Exhibit at the Center for the Arts where each artist is represented; or consult the catalog to choose artists and follow the map to their studios. The Art at the Source catalog is a year-round guide to local artists and businesses. After the Open Studio weekends, studios are open by appointment only.